Clive’s quality aviaries has evolved from the need to provide housing for his own bird collection. To work well, bird cages and aviaries have to take the needs of each particular bird into account as each species can have their own individual requirements. Of course the aviary still needs to be easy to keep clean and maintain for the owner as well. The right bird aviary is fundamental to keeping your birds happy and healthy, whether you’re a serious bird breeder or just like to keep a couple of “feathered friends” in the back yard. Different species of birds have different needs for housing depending on their size and country of origin. Your choice of aviary can make all the difference when you’re breeding birds. Birds who are not comfortable in their “home” will not breed well, if at all. Birds need to feel secure before they attempt to bring their offspring into the world and the correct aviary for your birds will ensure optimal success in your breeding program. Of course aviaries have to be people friendly too! They should have easy access for cleaning and feeding and also look good and blend in with your home environment. Or perhaps be designed to be the focal point of your garden. 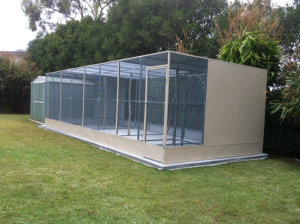 Clive’s aviaries are custom designed to suit both you and your birds. They are of sturdy construction, easily maintained with easy access to feed and water stations. Only quality materials are used. Our aviaries are based in Brisbane, Queensland ( Qld ), Australia. Clive will discuss your needs with you before agreeing on the type and size needed. He uses only quality materials for construction and his prices are more than competitive as well. A large bird aviary built by Clive will not cost as much as elsewhere! 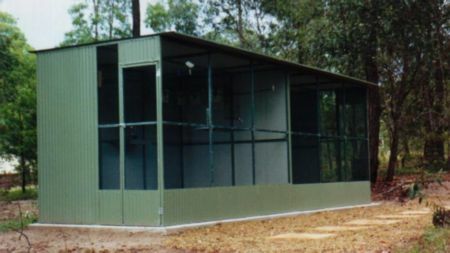 The main aviary types are the ground aviary (or conventional aviary), the hexagonal aviary and the suspended aviary. The different types all have their special features and uses. As well as aviaries, Clive also specializes in chicken runs, cat runs, guinea pig cages – in fact any type of cage or enclosure you could possibly dream up! 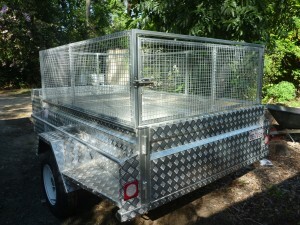 We have also built many dog cages, either free standing or fitted to the back of a ute or trailer. If you have any inquiries or would like to contact Clive, simply go to the contact page, or call us on 07 3200 1690 or 0412 118 343. Just ask any questions you like, we’re here to help! We service most areas in southern Qld. Also check out our testimonials page to see what other customers have to say. We are currently selling show boxes for birds that comply with the RSPCA guidelines. Do you supply to southern NSW, or do sell just for pick up only. I am after a hexagonal aviary with mesh of 2mm thickness or greater. If you are able to supply external slide in feed dishes or any other feature, please quote. Do you build or supply to Wolvi 25 mins east of Gympie. We live on a 18ha property and are trying to build averies for ringnecks, cockatiels, budgies, bourke parrots and finches. Hi just wondering what type of aviaries you sell for alexandrine parrots. And around how much you sell it for? Can you let me know what sizes your aviary wire comes in and price please. I am looking for 1200 mm x 12 mm squares, and 900 mm x 12 mm or 9 mm squares. I am looking to have a cage built for my 2 sun conures. It ideally needs to be patio friendly, on wheels, some what suspended, at least 2m long and a decent height to allow them more freedom of movement than normal cages. Can you please advise on an approximate costing for this. Do you deliver to nsw if so how much would it cost for a suspended aviary to breed a pair of cockatiels. Hi Clive (: we’d like a soft release cage made for our rescue possums. Can you send us a quote please. We are looking at having a portable outdoor bird cage built for a small courtyard. We live in a townhouse so don’t have a lot of space. Would also like your input on best position of cage, thanks. I’m also looking for one of these that you have built and can you please email me so I can send you a copy of the pictures that I would like you to rebuild ? I’m interested in a suspended aviary big enough for two canaries and a Diamond Dove to be comfortable. I am in Coomera on Gold Coast. Hello just want a price for a two bay suspened 2m by 2m make each bay 1m by 2 m. With one door at the front 30cm2 and tin roof over the hole thing with the back wall tin as well. A door on the sides as well. Hello, how much would it cost for a aviary 6m L x 3m W x 3m H?